Just ask any real movie fan: The sequel is bigger than the original‚ louder than the original‚ more complex than the original‚ and -- more often than not -- nowhere near as good as the original. Lucky for us Puppet Mischief is the exception to that rule. The original in this case is John Ellis & Double-Wide's stunningly whacked-out debut Dance Like There's No Tomorrow. The 2008 release was one of the best party discs to come out of New Orleans in over a decade‚ but it was also so surreal and over-the-top that trying to duplicate it would have been a fool's errand. Fortunately‚ Ellis chose exploration over repetition‚ and Mischief is much better for it. Ellis' alto sax was the focal point of Dance‚ and his Mischief solo work burns like towering fire‚ but his new partners announce their presence with authority on the sassy opener "Okra & Tomatoes." Harmonica player Gregoire Maret is already soloing over the initial melody‚ his high rising sound offering major contrast to Matt Perrine's booming Sousaphone. Mark Ferber's trombone comes from the same era as Perrine's "axe‚" but Ferber's muscular‚ uncompromising style juices the Yesterday-versus-Y2K dichotomy that makes Double-Wide's music so interesting. The expanded front line gives Ellis color and texture options he couldn't get from Double-Wide's original quartet structure: The funeral march "Dewey Dah" benefits from Maret's sad piping and lets Ellis launch a solo thick with demanding rage; "Carousel" reeks with abandonment‚ like the zydeco clowns from Dance forgot their tents when they left town; "Dublinland Carnival" flips that coin immediately‚ leading us down a manic Eastern European midway where sideshow freaks perform over alternating screams from Perrine and Maret. Brian Coogan's buzzing keyboards lack the comedic vibe Gary Versace brought to Dance‚ and that's actually a good thing‚ because too many clowns spoil… well‚ just about everything! There's certainly nothing funny about Jason Marsalis' contributions to Mischief. His drumming is absolutely titanic throughout the date‚ and his out-solo on "Heroes de Acción" just cannot be believed. The disc concludes with "This Too Shall Pass‚" a robust blues that gains great irony in light of the Deepwater Horizon disaster. 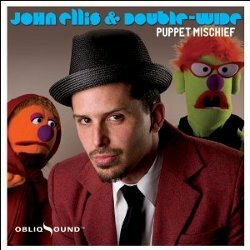 Puppet Mischief is a sequel that is‚ in many ways‚ better than the original‚ and some new stuff Ellis & Double-Wide played on tour means there's more to come. Let's remember what Scream 3 taught us about trilogies: Anything goes.